This classic cookbook offers so much more than a collection of recipes--it captures the spirit of the Russian people and their cuisine. From zavtrak (breakfast) to uzhin (dinner), Russians love to eat heartily.Originally published in 1947, The Best of Russian Cooking is a treasured classic that combines authentic Russian recipes with culinary tips and invaluable cultural insights.This expanded edition features a concise list of menu terms, sections on Russian table traditions and mealtimes, and a guide to special cooking utensils. It was in depth and very easy to follow recipes.It also provided recipes in an historical perspective. You may have difficulty getting to the recipes, because Alexandra Kropotkin's narrative is so engaging, you'll want to read it through for all of her insight into pre-Soviet Russian life and manners, especially the life and manners of the upper class.It seems as though Ms. Kropotkin had a not-insignificant position at one point (in fact, the man who wrote the forward calls her "Princess"), and she had to flee to England when the revolution came, and she learned to make traditional Russian meals using the ingredients found wherever she happened to be. If you focus on the narrative, however, you will miss the fabulous food.The food is all very rich, and none of it is made with pre-prepared over-processed food, but good solid ingredients like milk and eggs and flour, and of course, sour cream and dill and turnips.Though some of the recipes are time-consuming (the 'yellow consomme' used to make cabbage soup simmers for three hours, for example), they are all accessible to cooks with even a little bit of experience.Princess Kropotkin talks you through the recipes like a good friend or a mother might, leading you every step of the way. I grew up in a home filled with Russian cooking: the cuisine frozen in time that Lynn Visson captures in the Russian Heritage Cookbook. We tend to know just a few dishes that have some loose association with Russia: Chicken Kiev, and Beef Stroganoff, for example, which both have significant French influences, or Borscht, a simple dish indeed. With the fall of that awful wall Russian cuisine has enjoyed a renaissance, even in Russia herself. Visson exploits today's new interest in this world cuisine with her exhaustive coverage of every conceivable course, all based on authentic, pre-revolutionary recipes. As an example, for kotelety alone she gives us five different family recipes. (It's a shame she didn't consult my mother, former professor of Russian, for another five). For shashlyk (Georgian meat on skewers similar to shish kebab) she gives no fewer than three possible marinades. Real cooking by real people demands such variety and depth. Bravo! I have seen several cookbooks covering eastern European cuisines that are nothing more than collections of relatively simple recipes, where the primary objective is number of recipes and the secondary objective is a reasonable faithfulness to their sources. These books give no insights into the wellsprings of these cuisines and typically give only the simplest versions of classic recipes. This book does not fit this description. It is a rich evocation of 19th century Russian cuisine and it's influences, and those things it has influenced. While the current edition is being published in 2004, this is the second edition of a book the author states was originally published 20 years ago, although the copyright page does not state the date of the first edition. The only reason for this I can see is that this is the first edition to be published in the United States. I bring this up for three reasons. First, if a book survives to a second edition, it means the first edition was well received and worthy of an update. Second, this means this worthy book was probably improved in the reissue. Third, and most interesting, is the fact that the two editions straddle the fall of the USSR, and the author has several interesting observations on this fact. The author's introduction and the discussion of Russian cuisine in the USSR is an interesting take on Paula Wolfert's contention that one of the requirements for a sustenance of a great cuisine is an aristocracy which can support a class of creative chefs. This was certainly true of Czarist Russia, and it was certainly not true of Russia in the USSR. In spite of how immediate these events are to us, it is still surprising to read that even up to the very end of the Soviet regime, access to fresh or gourmet foods was difficult even in Moscow and St. Petersburg, and, this access is much greater today. It is common knowledge that in the 19th century, Russia was enamored of all things French, especially of French cuisine. Many French chefs were brought in to cook for noble and wealthy families and many Russian chefs were sent to Paris to learn to cook the French cuisine (Some failed to use their return ticket). What may be less commonly known is that many French chefs returned from Russia and opened Russian cuisine restaurants in Paris. Other than France, the greatest foreign influence on Russian cuisine seems to be Scandinavia and fish from the Baltic and northern Atlantic. The most prominent local ingredients are, of course, caviar, vodka, eggs, dairy (yogurt and sour cream), rye, and kasha (buckwheat). The preservation method of choice is pickling. Root vegetables and mushrooms seem to play a very large part of this cuisine. The prominence of mushrooms seems surprising, as I most commonly associate them with temperate forests, not frozen steppes, but then again, Russia is a very large country. Zakuski, the Russian take on hors d'ourves and antipasti. I do not take the author seriously when she says this is a distinctly Russian custom after hearing stories of Italian Trattoria tables groaning under the weight of heaping antipasti. The stars of Zakuski are pickled herring, mushrooms, cucumbers, cottage cheese, and hard cooked eggs. In fact, I was surprised to find hard-cooked eggs with filling from spiced yolks so common, as it is also such an American stable. Soups, or, borshch, borshch, and more borshch, and potatoes and onions (All spellings are Russian, not necessarily the most familiar spelling to American eyes, as in borshch for borscht). Pirogs and pancakes includes the famous Russian platform for caviar, the blini. Fish, primarily salmon, cod, pike, carp, and trout. A large number of recipes are simply for `fish'. It is probably not surprising that there are no recipes for salt cod, as it was probably cold enough to naturally refrigerate the fish for half the year. I suspect also that salt was not as plentiful as it was on the temperate Atlantic coast or certainly not as common as in the Mediterranean. Meat and poultry features beef with many traditional Russian ingredients, as in Beef Stroganoff made with sour cream and served on noodles. Vegetables, a classic intersection of Russian ingredients and French preparations. Potatoes and cabbage are the stars here, with a strong showing by mushrooms and other root vegetables and cabbage family members. Desserts feature cakes and tortes. There are few tropical fruits here, but bananas and pineapple do make an appearance. Chocolate is common and cherries are very big along with kasha and dairy. Sauces, jams, and drinks provides the usual pantry items, starring horseradish, beets, and sour cream. The author is more of a scholar and writer than a chef and almost every recipe is attributed to a contributor who was born in Russia or born of Russian parents. The culinary cautions are a bit slim and an experienced amateur cook may have much more success with them than a total newbie. The background writing approaches the quality found in works by Claudia Roden but not quite up to the breathless immediacy you can get from Paula Wolfert or the freshness you get from Patricia Wells or some of the better Italian regional cuisine specialists. Most of this is due to the fact that the subject is so clearly in the past, so some dryness may be expected. 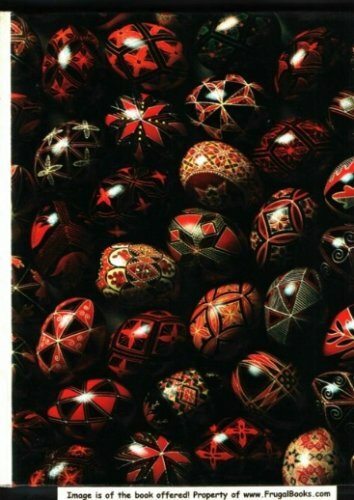 I did miss a recipe for Easter bread, but I did get four different recipes for the Russian Easter cheese dish, Pashka. Highly recommended source on eastern European food. Almost four hundred recipes are packed in a culinary discussion of Russian traditions gathered from the Russian émigré community of New York City. 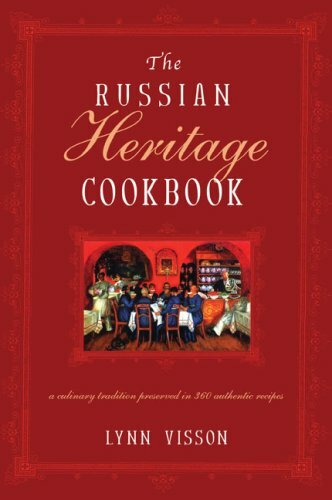 Russian Heritage Cookbook goes far beyond the familiar dishes of Borscht and Stroganoff to explore other classic dishes such as Mushroom Solianka and a wealth of veal dishes, introducing each chapter with cultural insights and including variations on dish themes. 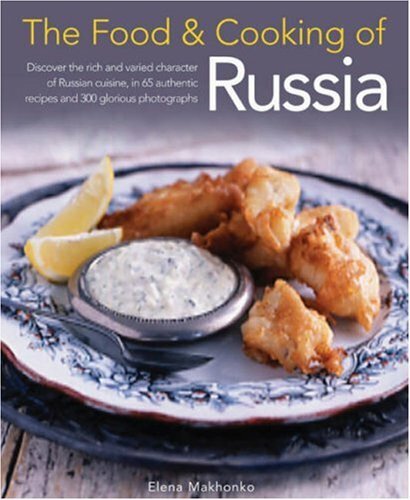 An outstanding guide for any fan of Russian culture and cuisine. Theonly drawback to this book, in my experience, is that one or two of therecipes seem to be a bit vague or off the mark regarding specifiedquantities.Maybe it's me, but I always find myself with too much fillingfor the allotted amount of dough in some of the pirozhki recipes.Fortunately, the dough is easy enough to make more of, and you can't maketoo many pirozhki (once you're on a roll! ); they freeze and re-heatbeautifully. (Try the Nabokova recipes - the cabbage filled pirozhki areespecially delicious! )This problem may be a result of the book being -essentially - a collection of recipes from various sources, and perhapsthis new edition has tested the recipes anew and solved this infrequentproblem. Other than finding myself with too much cabbage filling, myresults have been consistently good and extremely tasty! In addition tothe great zakuski section, and the classic dishes (try 'PozharskiKotlety'), I highly recommend the sweets! The Trifunovich Napoleon isdivine, the flourless, vodka-infused Apricot cake is fabulous, and thePaskha and Kisel' desserts are uniquely Russian and quitedelicious. Our two children are from Russia, and this book has lots of wonderful authentic Russian recipes that they enjoy making.The Russian names of the dishes are also given.Great, simple recipes. This is a good little book for children or a beginning cook looking for Russian flavour. But honestly, the price was a bit much for a book with less than 50 pages and less than 2 dozen recipes. You can findthe same recipes in the larger books.....plus many others, for less money. 5. 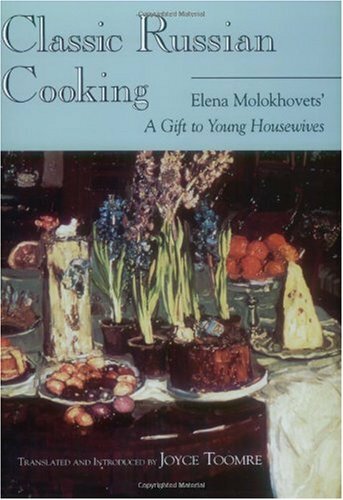 Classic Russian Cooking: Elena Molokhovets' "A Gift to Young Housewives"
First published in 1861, this "bible" of Russian homemakers offered not only a compendium of recipes, but also instructions about such matters as setting up a kitchen, managing servants, shopping, and proper winter storage. Joyce Toomre has superbly translated and annotated over one thousand of the recipes and has written a thorough and fascinating introduction which discusses the history of Russian cuisine and summarizes Molokhovets' advice on household management. A treasure trove for culinary historians, serious cooks and cookbook readers, and scholars of Russian history and culture. I want the rest of the book! The title of the book is misleading. IT IS NOT a translation of ELENA MILOKHOVET's famous book. It is ONLY selections from the great book. This is so small a part of the book, I can only give 3 stars. The Classic Russian Cooking is a shadow of the Russian original. It is a nice addition for those who have the Art of Russian Cuisine. 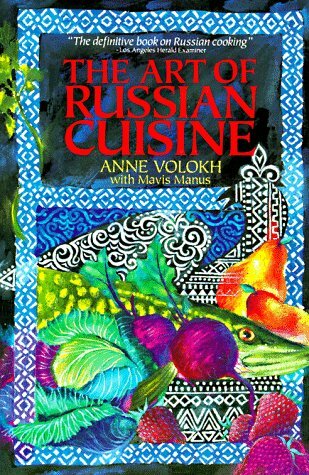 Until this great cookbook is 100% translated, I recommend The Art of Russian Cuisine by Anne Volokh for those wanting to learn classic Russian cooking. I wait a full translation of Elena Molokhovet's "A Gift to Young Housewives".The limited parts translated are well done. It is a real shame that this book is only selections. I seriously dislike when translators change the nature of books by seletive translation. "Oh, I don't think this sections is interesting. Let's not bother translating it." This book only includes 25% or the recipes in the original. The book is still valuable for the historian who wants to know more about life in Russia 100 years ago. For the cook who wants to cook Russian food you just have to accept that the translator removed 75% of the recipes. So it looks like we will have to wait for the full translation of this book. I found this book recommended to me by my Russian professor, and after eating at a Russian dinner hosted by my university's Russian club, I decided I really had to have this book. It has an excellent introduction which covers a large variety of topics on Russian cooking through the years. Another thing I like about it is that it uses mainly ingredients that are commonly available today. Although a few of the ingredients used are highly unusual today (like dried backbone of a fish), they appear in relatively few of the recipies. I am anticipating cooking recipies from it! This is such a classic that it was intended, in the past, to be given to young housewives to be a much-used reference. As such, in addition to the predictable recipes for coulibiac (fish in pastry crust), sturgeon, borscht, kasha and Russian sweets, there is a wide variety of household food preservation and preparation you just don't find in today's cookbooks. Such as--butchering a pig and then portioning out, preserving and preparing the resulting meats. NOT for vegans or the fainthearted, believe me. Also, there are recipes for improving the flavor of homemade vodka (including how to make birch charcoal for the purpose.) And how to make imitation butter from mutton fat, how to get rid of the off-flavor in butter that is going rancid. If you are a home-brewer, this is a surprisingly good book for making such things as mead and fruit wines and liquers. One caveat for the whole book; measurements are either baffling, in Russian terminology that has no English referent, or "two wineglasses" , etc. And for brewers, it requires some basic knowledge of the process. For cooking, there are a lot of beef and fish recipes but the borscht recipes were disappointing as there were only of few of these and there are LOTS of ways to make borscht. However, for interesting reading on food history and technique, and for some authentic Russian cooking, this book is absolutely fascinating reading. A historical crossroads in Central Asia, Uzbekistan and its cuisine reflect the range of nationalities that form the country and continue to flourish there. Meat pies from India, soups and cakes from Russia, and noodles from China coexist with varied spices, dried fruits and nuts, and traditional golden flat breads. 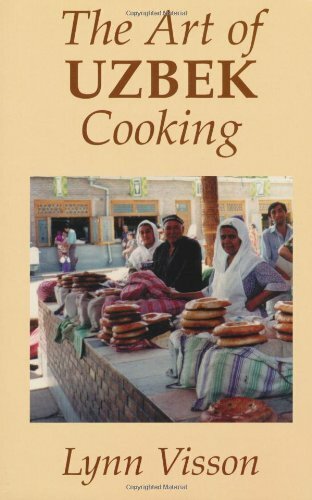 The Art of Uzbek Cooking provides an introduction to a little-known and exciting culture through easy-to-follow recipes that have been tested and adapted for American kitchens. I think the authors captured the essence of the region well. There are however some russian recipies mixed in, but that understandable as Uzbekistan was part of the Soviet Union and the mix of cultures occured. I found this book wonderful for two reasons - exotic yet undaunting recipes (delicious! ); plus the fascinating background cultural information.I agree with the other readers - Hippocrene did a terrible job with the binding - cheap and falling apart!Nevertheless I strongly recommend this book - it is a culinary and cultural masterpiece regarding a cuisine little known in North America.Lynn Visson - Great Job! Due to the course of world events, Central Asia has been in the news a great deal lately, but the cuisine and culture of this region remains a mystery to most people in North America. This book makes the food of this region accessible to the English speaking world. Uzbek cooking bears an intriguing mixture of influences: The Middle East, Russia, India, and China have all influenced the cuisine. The recipes in this book are excellent and easy to prepare. We enjoyed the Lamb Plov, served with flatbread and the pomegranate and white radish salad. One negative, though: I must agree with Djonn from Toronto that the binding of this book is of very poor quality: ours fell apart on the first use! Growing up Bukharan in 1970's North America, I have had a difficult time explaining to people where I'm from etc.Thank goodness someone has finally taken an interest in and published a book about my favourite aspect of my culture . . . Food! 1)It is poorly bound.My copy fell apart after about 2 months. 2)There are no photographs accompanying any of the recipes.This is a shame considering that most people are unfamiliar with this cuisine and wouldn't know how it's supposed to turn out or what the ideal presentation should be. 3)The index (is bad).It's basically the table of contents but in alphabetical order.If you're looking for, say, all recipes with mung beans, you will have to search through the entire book to find them. However, after all this I still urge you to buy this book.Why?Because the recipes are easy to follow, nutritious, filling and delicious. (And of course, exotic.) Also, if you're interested in the history of this fabled land of the Silk Road, you'll find this a well written & researched book that you could curl up with as well as cook from. 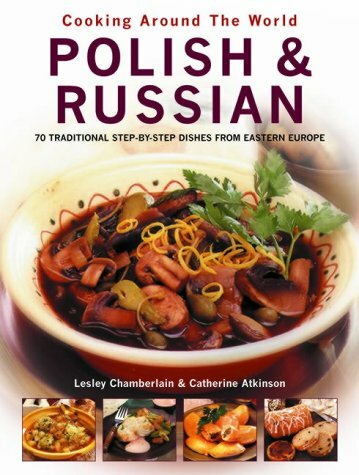 Easy-to-follow instructions, adapted for modern American cooking, for over 200 mouthwatering traditional dishes: borsch, shashlik of salmon, Russian squab in sour cream, potato kotlety, pirozhki and pirogi, blini, paskha and many more. Also origins of Russian foods, helpful hints on buying and preparing foods, much else. Definition of terms. Russian Cookbook by Kira is still a great item. This is the best Russian Cookbook ever. I received a xerox copy of the original hardbound book when I got married 42 years ago.It was getting hard to read a lot of the pages but still great to use.I was so happy to find this book at a reasonable price from a great seller. I bought 2 copies so my daughter now can cook great food too. Thanks for your excellent service. This book was recently discovered by me on a bookshelf in a spare bedroom. "Well, it couldn't be that bad", I thought. I was wrong. It can. As far as I remember, I have not cooked a single recipe out of it in the three years that I have owned the book (the fact that my father sent me a cookbook in Russian from Russia must have played a role). 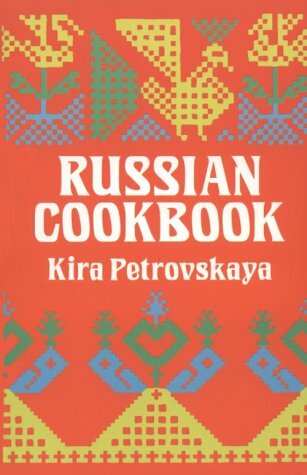 The recipes in Petrovskaya's book are NOT authenticly Russian. So if you are indeed a Russian living in America, don't waste your money (and if you are not convinced, should I mention her recipe for plov without meat?)! It is geared towards an American cook not familiar with Russian food in the least. On the positive note, it will not send you on a wild goose chase searching for some exotic ingredient (tvorog, for example) to the local supermarket. So if you fit the description above (American, never been to Russia, never tasted Russian food) it might be for you. A personal grudge I hold against Kira Petrovskaya is her CONSTANT mention of unsatiable Russian appetite. In fact, from my experience (and from my 20 years of experience living in Russia), Russians don't eat anywhere near as much as Americans (and hence as a nation are not obese). Overall, pass this book for a much better (although not perfect) Anya Von Bremzen's "Please to the Table"
My husband bought this book for holidays. I didn't make any recipes from this book because they are disgusting. I grow up in Ukraine so I know Russian and Ukraine cooking and this book wouldn't taste like Russian cooking. I would never make any cooking from this book, better buy a "Please to the Table: The Russian Cookbook" very good cookbook and great recipes. Don't waste your money on this book. 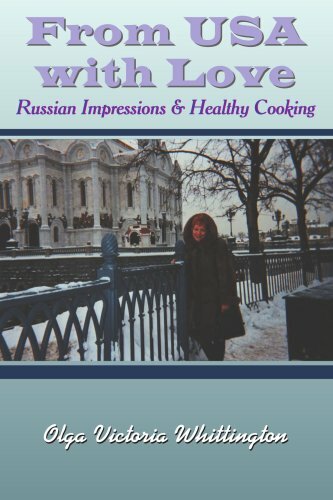 "Russian Festive Cooking" is a short (48 pp. & about 55 recipes), but useful cookbook.The recipes are from all parts of Russia (including some of the independent states that formed after the fall of the USSR).These are not holiday dishes, but are the sort of good food one wants to have for a small (or large) party.Most of the recipes have a very good color photo of the finished dish, which will help cooks to prepare the food properly.The book is high quality and is printed on very good paper.I found the recipes to be straight-forward and clear.However, there are dishes included that must be started days ahead, to prepare them properly. (Some of the dishes require fermentation of one or more ingredients. )Be sure to read the recipes carefully and to prepare a small dish for your family, before attempting to make food for any party, or for visitors. The Art of Russian Cuisine is almost as immense as thevast expanses of Mother Russia. Filled with 500 recipes for classicRussian dishes, it also provides a history of Russian food andculinary life. Anne Volokh, a Russian food writer who eventuallyemigrated to the U.S., enlivens her work by including passages fromRussian literature and historical works. She concentrates on authenticcooking, often drawing recipes from A Gift to Young Housewiveswritten by Ellena Molokhovets in the 1870s. The result brings to lifehow Russians ate when their rivers ran thick with fish and aristocratshad French chefs invent elaborate dishes like Veal Orloff, made withtwo creamy sauces. Naturally, Volokh starts with zakuski,the antipasto-like ceremony that can constitute a meal in itself;including herring, caviar, salads, even suckling pig in aspic. Forsoups, there are peasant-hearty borschts--which are actuallyUkrainian, not Russian--and spicy Selianka, an example of upper-classcooking. In Russia, each soup has a proper garnish or accompaniment;Volokh provides them all, from sliced eggs in cold borscht to yeastygarlic rolls with the hot kind. Dishes such as Beef Stroganoff,Stuffed Cabbage, proper Bliny and Pashka (the sweetened cheesedessert), require culinary expertise, great patience, or both tomake. But dishes such as Roasted Chicken with Raisin-Studded Stuffingand Baked Trout with Walnut-Based Satsivi Sauce are simple butrich. I ordered this book November 2, and by the 30th it still hadn't arrived. When I contacted the seller she said that she had sent it out the next day, so it must have gotten lost in the mail. However, after reading the other negative reviews, I saw that this is not an uncommon complaint. She offered to send me a used copy, but having ordered and paid for a new one, I thought this ridiculous. I chose a refund fearing that it would take another month to never receive the second book. I would really like to know who's in charge of shipping out her products because they're horribly incompetent. Bad service. I grew up in Russia. Very good recipes, an excellent introduction to Russian cooking tradition. The book is excellent at taking into account the availability (or the lack of) certain ingredients in US supermarkets. I have tried many recipes in this book, and most have turned out quite well (her borshch is excellent).However, i use some as a general guide and improvise, and to jog my memory of the time i used to cook with my grandmother -- they are just not up to her standards.A number of them seem "sovietized" (my opinion, i've never lived there, but i know money was tight and some unusual or expensive ingredients were difficult to find for many years). Example:my granny's paskha recipe calls for 5 lbs. bakers cheese, 20 yolks, 4 cups sugar, whipping cream, nearly 2 lbs. butter, lots of vanilla beans (among other things); Volokh's recipe is quite frugal in comparison. I realize that good food takes time, but some recipes are WAY too time consuming, particularly those in the Pirogi section due to the way the chapter is structured, which forces you to flip back and forth between pages to assemble. 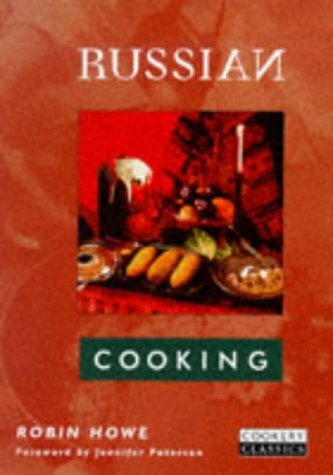 Overall, an excellent, comprehensive collection of Russian recipes (with a few from non-Russian Commonwealth regions).The Wild Game chapter is particularly impressive. It took me a long time to find a good Russian cookbook.This is the best one I discovered so far. I was born in Russia, however, never learned how to cook Russian food.I missed my grandmother's cooking from my childhood.So, I started looking... "Taste of Russia" & "Please to the Table" are wonderful cookbooks with great recipies.However, they are not the recipies I remember my grandmother cooking. "The Art of Russian Cuisine" includes almost all the recipies I could think of. I definitely recommend this book to those of you who wants to taste the real Russian food, the one that Russians cook daily or for holidays. As another reviewer has pointed out, this is NOT a pretty picture book of wonderful presentations.No, this is a pretty down to earth work which gets into the nitty-gritty of cooking.Do not look for conversion tables or all of those "you can substituted this for that" little notes.No, you actually had better know your way around a kitchen.Not that the book is not well written; far from it!The directions are quite precise, measurements exact, and this little work is filled with cultural observations and bits of information, that while may not come up in everyday conversation, are never the less nice to know. 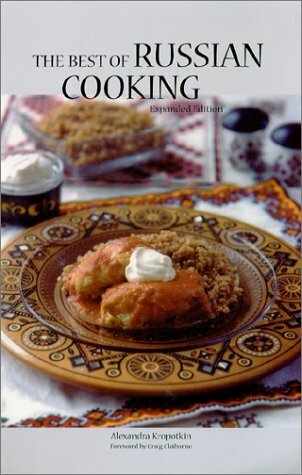 We have here a 112 page oddly sized, spiral bound book that gives us a good representation of Russian dishes.Chebureki, Manty, Uzbek Palov, Kapsarullid (lot of these cabbage dishes), Sult, Bitki s Zapravkoi Gorchichnoi, Chuchkella. Gozinakh, Khalva....what, you don't read Russian?Well fear not.Each dish is accompanied by an English translation and written description of the dish. While at first glance some of these dishes may seem rather exotic, upon closer examination it becomes quite apparent that the sneaky Russians have infiltrated even our kitchens and the reader will find many dishes and offerings quite familiar.Let's face it, Lokshyna, Zapechena, if you squint your eyes, becomes Egg Noodle and Spinach Casserole very quickly.On the other hand, Braised Veal with Caviar Sauce, Jellied Veal, Skewered Pork with Pomegranate Syrup and Ground Lamb Sausage probably did not show up at your last church pot-luck. All in all this is an intriguing little book.We have tried several of the recipes and all have turned out quite well. This is one of a series of ethnic cooking that Time-Life published first in 1969 and updated in 1977.They are a good addition to any kitchen arsenal and make for some interesting eating and reading.I must give this a four star recommendation even though there are no pictures.Actually, I am not overly fond of pictures as my dishes never turn out looking anything like what you see in the fancy and slick new books of today.If you can find a set of these books, including this one, grab it...you will not be sorry. 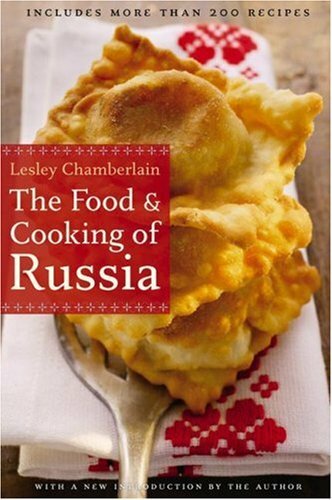 Lesley Chamberlain lived in Soviet Russia in 197879 and recorded her experiences in the form of two hundred recipes interwoven with details of Russian culture and history and her own practical advice. 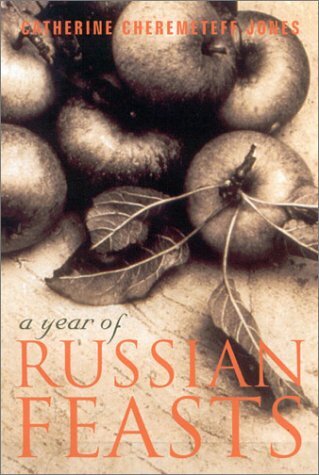 From blini to cabbage soup, and caviar eggs to Russian salad,” she reveals the continuity of Russian life, despite political repression, in which the bourgeois cooking of the nineteenth century coexisted with old dishes dictated by the church calendar and new inventions to make do” with the frequent shortages of vital ingredients under the Soviets. First published in 1982, this fine collection of recipes and entertaining literary quotations has become a classic introduction to the rich culinary history of the region. This new Bison Books edition contains period illustrations and a new introduction by the author. as a gift for my Russian family and friends. Fabulous recipes and a wonderful story of this family! I love this book. I originally checked it out from my library but, decided that the recipes were too good and the story of this family was too endearing to not have my own copy. I have shared it with many people since I got my own copy! Fascinating and insightful - with recipes! I've been interested in all things Russia since adopting my son two years ago from the Voronezh region, and this book has helped to keep that interest going. It's not just a basic cookbook, but more a travelogue and cultural history with recipes added in. I like how the author explains social and family traditions along with her seasonal exploration of Russian food. After all, our special foods aren't made and consumed in a vacuum - tradition and custom dictate many of our special menus. If you read this book you will get a better understanding of how and why the Russians do what they do. It makes me wish I'd tried harder to eat real Russian food when I was there. Jones's memoir-cookbook takes the reader on a personal journey to Russia, the land of Jones's ancestors.It's full of interesting stories about the people she encountered there, with a focus on culinary topics.Each chapter deals with a single theme: springtime in Russia, tea and birthday parties, home-canning, mushroom hunting, weddings, Christmas and New Year's celebrations--all from the personal perspective of the author and her experiences in Russia.The 40 recipes she includes are accurate and can be easily reproduced in American home kitchens.A "must-buy" book for anyone interested in Russian cuisine. The definitive modern cookbook on Russian cuisine, layering superbly researched recipes with informative essays on the dishes rich historical and cultural context. With over 200 recipes on everything from borshch to blini, from Salmon Coulibiac to Beef Stew with Rum, from Marinated Mushrooms to Walnut-Honey Filled Pies, A Taste of Russia shows off the best that Russian cooking has to offer. Full of great quotes from Russian literature about Russian food and designed in a convenient wide format that stays open during use. I spent a month visiting Russia. I tried to sample as many Russian dishes as possible. I eat in homes, small town cafes, etc. On my return, I was looking for a cookbook that had the foods I tasted. This cookbook brings true Russian cooking to the USA table. If you want to enjoy tasty Russian meals without going to visit Russia, this is the cookbook for you. I first found this book on sale, years ago, at a Catherine the Great museum exhibit. I bought it and tried out some of the recipes. My favorite recipes were the Baked Apples (very simple to make) and the Black Bread (a bit more time consuming, but worth it). It seems the author wanted to maintain the authenticity of true Russian cuisine. 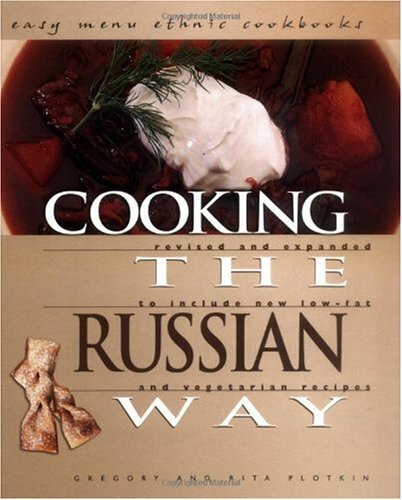 If you want to try cooking some Russian style foods, I would highly recommend this book. This is a great cookbook.A lot of time & work was put into it.However, some of my favorite Russian recipies are missing from this book.I would recommend "The Art of Russian Cuisine" for those of you who are interested in food that Russians cook daily or for holidays. Having spent a lot of time working in the former Soviet Union, and trying to reconstruct many of the wonderful and interesting dishes from various republics, I was delighted to find a book that "translated", "a pinch of this and a gram of that" into something I could understand and make with products available to me here in the US. I recommend this cookbook to anyone who has tried food from Eastern Europe, enjoyed it and wants to bring it up to our standards. The book is so popular with my friends that I keep giving it as a gift. However, I do feel the title "A Taste of Russia" is not "politically correct", since the dishes are from many of the 17 former republics of the Soviet Union, Russia being only one of them. A taste of culture too! This is an amazing, huge cook book. It has recipes not only from Russia but from all over the Soviet Union; so there are a wide variety of regional cooking styles represented. All the recipes we have tried have been excellent. We particularly like the Moldavian potato and scallion salad. We have made it several times to take to parties and everyone likes it. The baked cabbage with feta is also Moldavian and to die for! We have not tried any of the meat recipes, but look forward to doing so. This book is an enjoyable travel guide in the sense of what one might expect to find in the markets and where a tourist could get a decent meal. For instance, museum cafeterias are mentioned as being available and pretty good. Informative personal stories accompany the recipes. The price of a new book is high but there are used ones available. After searching high and low for this book it arrived within 4 days, in great condition and packaged perfectly. It has brought back so many wonderful cooking memories from my beautiful Babushka! About five years ago I met and started to date a young Russian woman. 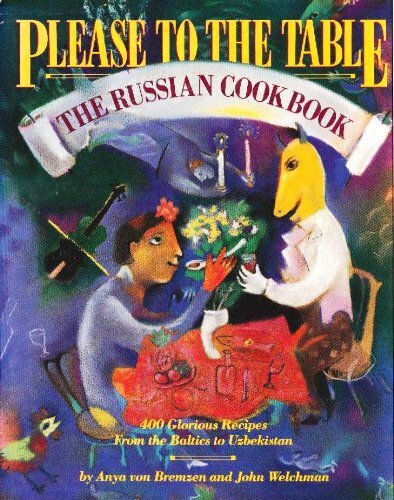 When my birthday came around, she gave me a copy of PLEASE TO THE TABLE: THE RUSSIAN COOKBOOK. It was quite a tome. 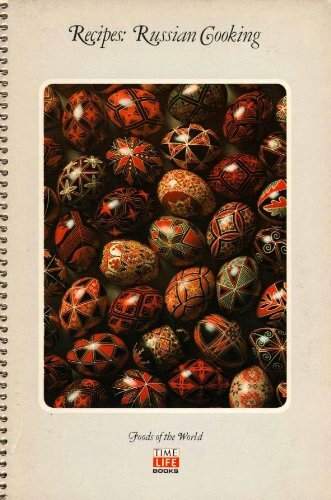 Not only did it have 100 recipes from all of Russia (actually, not only Russia but also all the other countries of the old Soviet Union), it also had interesting information about the various regions, the food and the people. It presented rather interesting information for me in that the parents of my mother immigrated to the U.S. from Russia (now known as Ukraine) in the early 1900s. Many of the recipes resemble many of my mothers favorite dishes that I remember fondly from my childhood. All in all, I would say that this cookbook was a bit overwhelming, but a rather high quality paperback book. I was single for over 50 years beyond the time of leaving home. Of course, I could do a certain amount of basic cooking (i.e., frying eggs, Crock Pot casseroles, bar-b-cue, sandwiches and other simple fare), but this cookbook stretched my talents and required ingredients and procedures I have never used. In short, it presented a great variety of wonderful recipes, but was a bit intimidating. Well, we got around this hurdle by having my Russian friend prepare a number of fine Russian dishes from the book for me to sample and enjoy. I aided in the preparation, but she was a much better cook than me. To greatly shorten a much longer story, she is now my wife and we have a wonderful year-old baby boy. The Please to the Table cookbook now occupies a prominent place in our kitchen area and my wife puts it to good use from time to time. What a great cookbook.I first borrowed it from the public library, then after I had slapped several post it notes onto the pages with recipies I wanted to try, I realized that I must own the book! The two recipies I've done so far have turned out great, and I'm looking forward to recreating several more dishes from Russia and its old republics during the winter months. Surprising number of recipes for its size. Russian Cooking contains a surprising diversity of Russian recipes for such a small book. A reprint of a book originally published in the 1960's, the commentary makes for interesting reading from a historic perspective. Take, for example, Mrs Howe's observations on the Soviet cooking environment, or her remarks on the use of sour cream (that reveal perhaps a hint of a typically anglo-saxon suspicion of soured dairy products that has since, largely, disappeared). This book has scaled down versions of the recipes from the Russian Tea Room.The book is filled with anecdotes, and recipes, and may bring back memories of The Russian Tea Room.Care was taken by Faith Stewart-Gorden to assure that the recipes were just large recipes that were scaled back, rather they were recipes that were adjusted for cooking times, seasoning, and other changes to get version close to the restaurant. 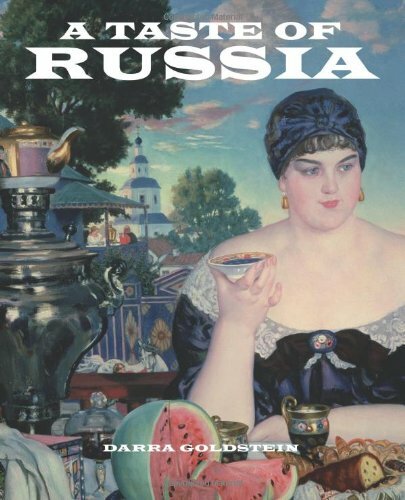 This book provides you with a good primer on Russian food. Recipes are made with ingredients that can be found at your grocery store.Most recipes are made with inexpensive ingredients.Some recipes to contain caviar, and fish that is more expensive, but overall the recipes do not take much effort in obtaining the ingredients. Also, it should be noted that the recipes are easy to follow.Instructions are not complicated, and even a beginner cook should be able to prepare these recipes successfully.I think this is a great addition to anyone's cooking library if you are looking to make Russian recipes.